Since I have come back, from my short trip to India, I have been super jetlagged. The lethargy has seeped into my bones as has the cold, and so every day, I strive to find easy recipes to make for dinner. Easy, Easier, Easiest -- has become my motto. You might look at me with pity and cook your own very difficult chotol maach er muithya from scratch but that is not going to deter me. I will stick to my easy and quick recipes for now. My eldest daughter who takes baking very seriously thinks baking a cake from a box is blasphemy. She doesn't know about me. Yet! 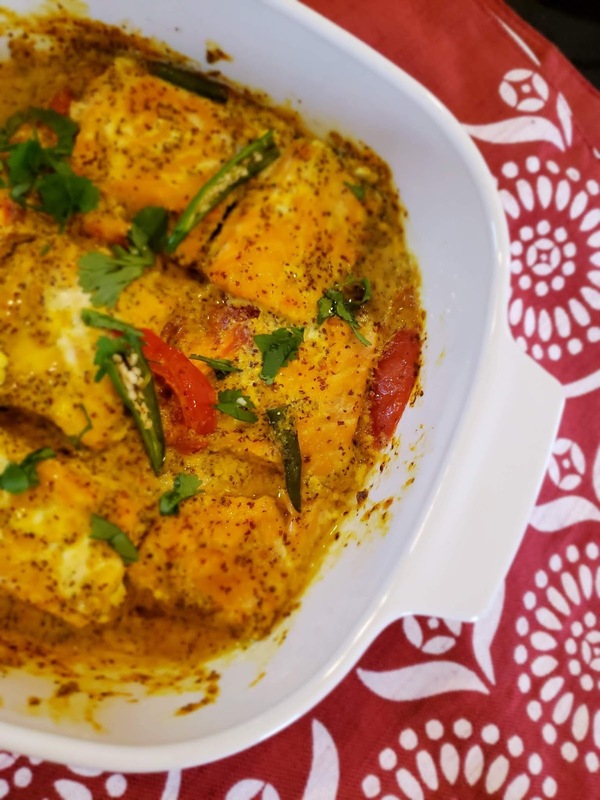 So this recipe is an upgrade of my old recipe called Shorshe Salmon Jhaal. I mean it's an easier oven baked version. 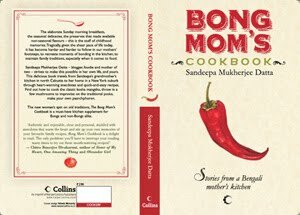 We all love salmon and we love it more when it is bangla-fied. 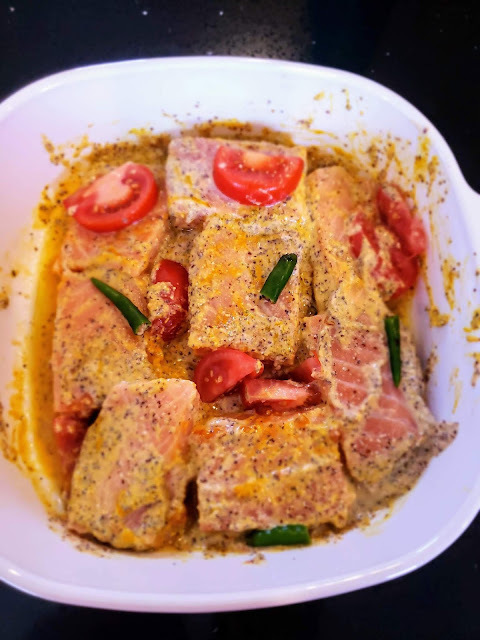 If you don't get salmon, don't fret, use any other fish that you use in a Bhapa recipe (steamed fish). No, leave Ilish alone. Use something like Bhetki, Basa or even Arh fish I think. When I buy salmon fillet I ask the skin to be removed. Then I cut each fillet in 3"x 3" squares. Okay, maybe some other dimension but small squares or rectangles. Toss the pieces with turmeric powder, and salt and keep aside. I had about 8 pieces of salmon fillet, each 3" x 3"
Pre-heat oven to 275 F. I have used a counter-top toaster oven for this dish so cooking time may vary with regular oven at same temp. Grease an oven safe baking dish with few drops of olive oil (or any oil). Next add the Tomato-Kashundi paste you made. Gently toss all of the fish pieces with the paste. Chop a small tomato and arrange it on top of the fish. Add some slit green chili for color. Drizzle 1tbsp more Mustard Oil if you want it more delicious. Now cover the baking dish and put it in the oven. Set the timer to 30 mins. After 30mins, the fish will be definitely cooked but the mustard paste will look little watery. If you are ok with it that is fine. I want a clingy sauce. So I open the cover on the baking dish and put it back in the oven (lowered at 250 F) for 10-15 more minutes. While serving add some fresh coriander leaves and few drops of Mustard Oil. So delicious.